It's easy to earn the ability to upload pictures or other attachments to your posts. All you need to do is to write a review for a machine in the database. Reviews should be more than a one liner and should include your thoughts on overall game play. You must access the machine database in order to enter a review. When writing a review please include your thoughts on appearance, sounds & overall game play. Also, you should own a machine for at least 30 days to let the newness wear off. I gave this play guide to Big Bear more approx six months ago and he didn't do anything with it so here it is. 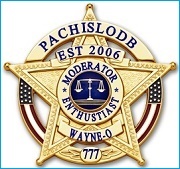 An exclusive from PachisloDB.com..